This video showcases the kind of world has been created by Liberalism. 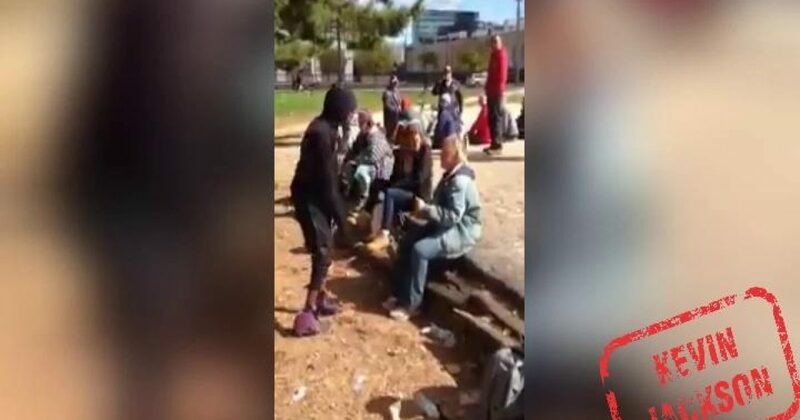 A homeless woman minding her own business is confronted by teen thugs. Watch as nobody intervenes to speak to these thugs, and after they brutalize her, it’s as if it never happened. This is undoubtedly a Liberal world. Because in a Conservative world, there would be a lot fewer homeless. Also, somebody there would have been armed. Finally, overwhelmingly Conservatives would have intervened and kicked the crap out of the entire lot of teens. In a Conservative world, the cops would have shown up, the situation explained, and the teens sent home, bloody and bruised, never to repeat an incident like that again. Their parents would invoke even more justice. The entire lot of people who helped kick those teens sorry asses would have been given awards for doing the right thing, and all would be good in the world. But we don’t live in a time when Conservatism rules the day. These teens are free to terrorize the next person they see, and you can bet it will happen.